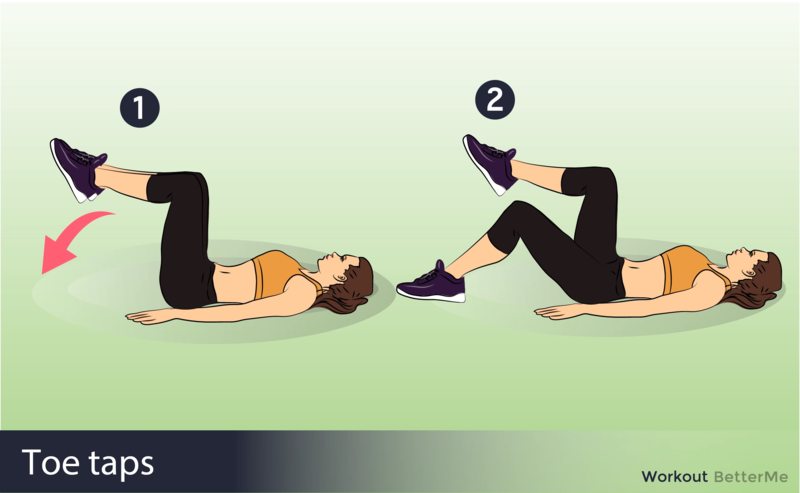 - Start out by lying on your right side with your legs lying on top of each other. Make sure your knees are bent a little bit. - Place your left hand behind your head. - Once you are in this set position, begin by moving your left elbow up as you would perform a normal crunch except this time the main emphasis is on your obliques. 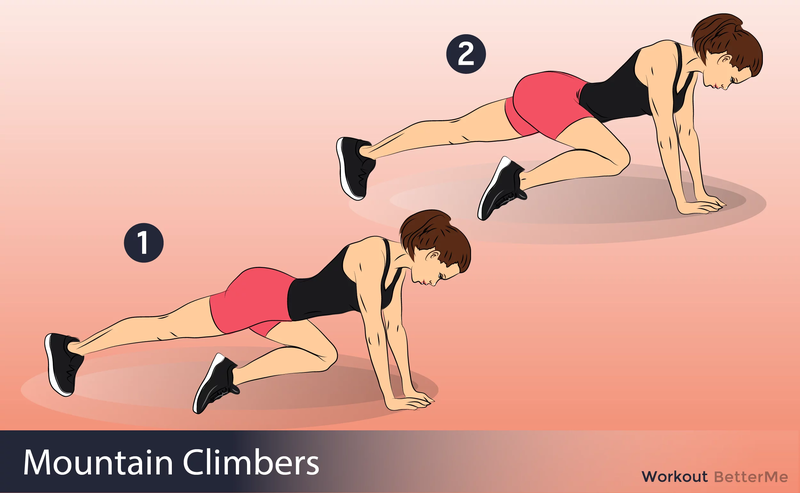 - Crunch as high as you can, hold the contraction for a second and then slowly drop back down into the starting position. - Stand on your left foot and, keeping your right leg straight, extend it behind your body. Lift your right foot slightly off the floor. - Reach both arms up over your head. Exhale and bend your right knee as you raise your knee in front of your body. - Bend both elbows and aim to reach your elbows to your right knee. Return your arms overhead and your right leg behind your body. - Start in a high plank. Bend one arm to bring the elbow and forearm to the floor. 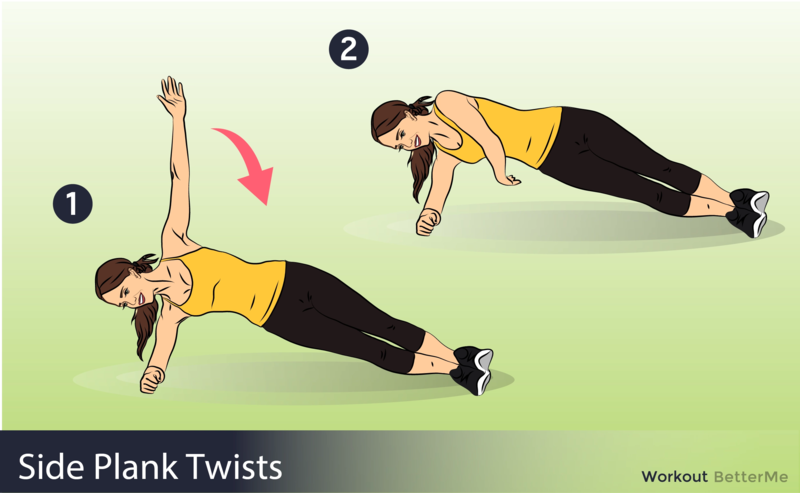 - Follow with the other arm so you are in a forearm plank. Starting with the arm you began with, push back up to a high plank. - Continue, alternating the first side down with each rep.
- Begin by laying flat down over the padding facing upwards. - Make sure legs are bent at the knees and feet are flat on the ground. - Your hands should be flat at your sides. - Begin by contracting your hamstrings, driving up your upper legs while flexing your core. - Try to keep feet off of the ground while simultaneously switching feet to stagger resistance. - Try not to cheat with your feet on the ground during this exercise. - Lie on your left side on the mat and position your elbow directly under your right shoulder. Stack together your legs, knees, ankles and feet. Tighten abs. - Push your right elbow against the floor as you lift up your glutes and hips off the floor until left shoulder, left hip, and left foot are in a straight line. Reach up with your right hand and extend. 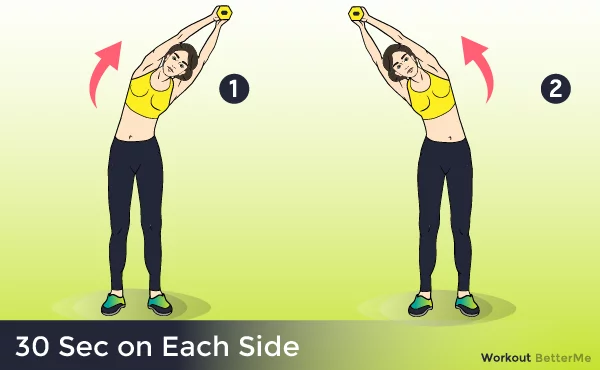 - Rotate your torso downwards and reach under your body with your left arm. Rotate back to the side plank with arm up and repeat for 10-12 times before switching sides. - Stand with your feet a little wider than hip distance apart holding a five- to 10-pound dumbbell over your head. Squeeze your head with your upper arms to fire up your core and protect your neck. - Bend sideways to the right, squeezing your waist on the right side. Keep your neck as neutral as possible, looking forward, not down. - Pull the left ribs down to return to standing upright. Switch sides, and bend to the left to complete one rep.